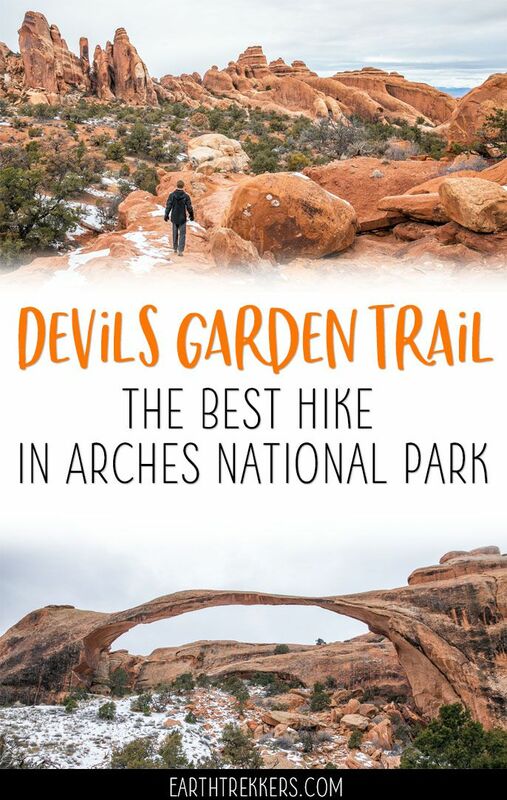 The Devils Garden Trail has all of the ingredients for a perfect hike in Arches National Park. 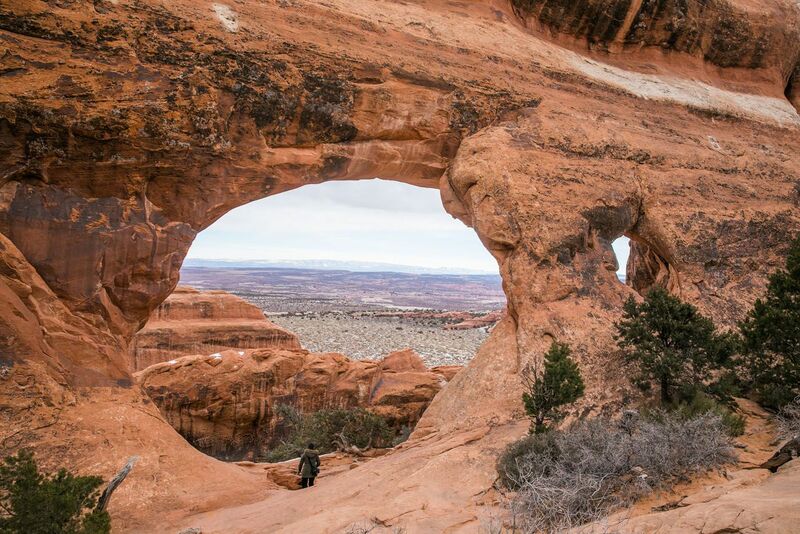 If you hike the entire 7.2-mile loop, you get to see eight arches! 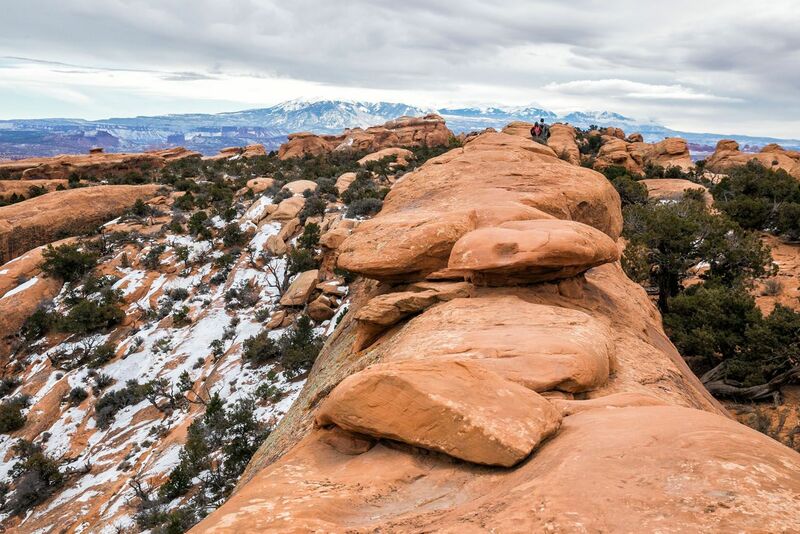 Along the way, go rock scrambling, hike along fins of sandstone rock, and enjoy some of the best views of the park. 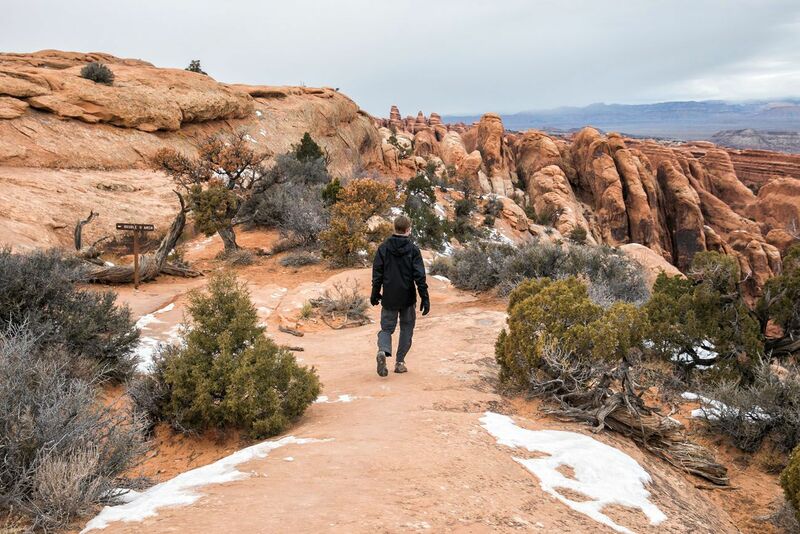 What makes the Devils Garden Trail so great is that you can pick and choose what you want to do. 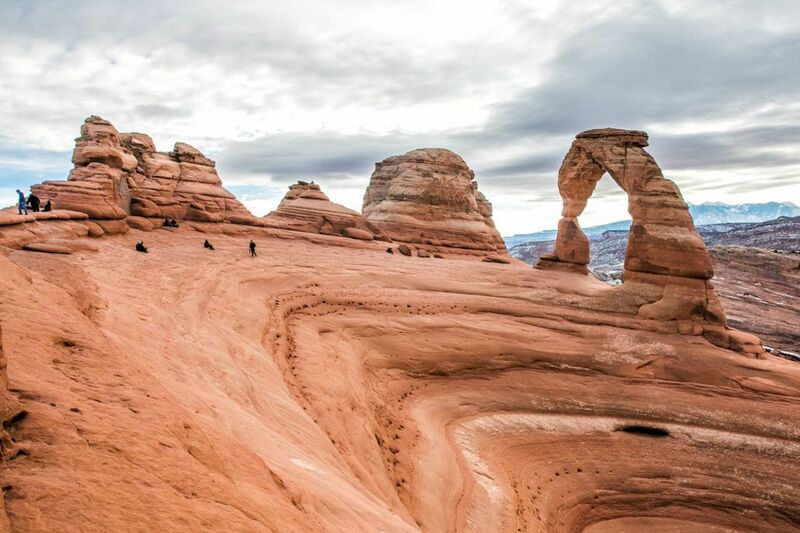 You can simply hike round trip to Landscape Arch (it’s only 1.6 miles round trip). From the main trail there are two spur trails that detour to more arches. Once you get to the end of the main trail, you can hike back the way you came or try out your route finding skills on the Primitive Trail. 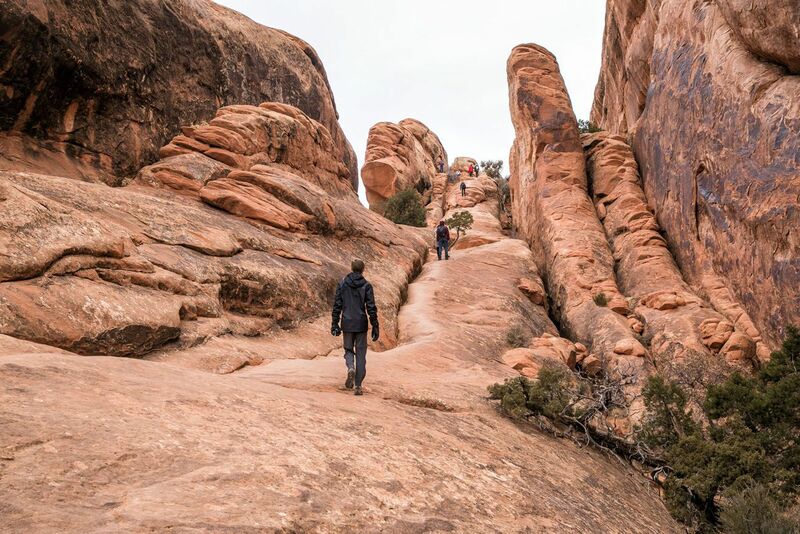 If you are visiting Arches as a family or in a group, some people may choose to explore the easier trails at the front of the hike. Those feeling more adventurous can keep going. 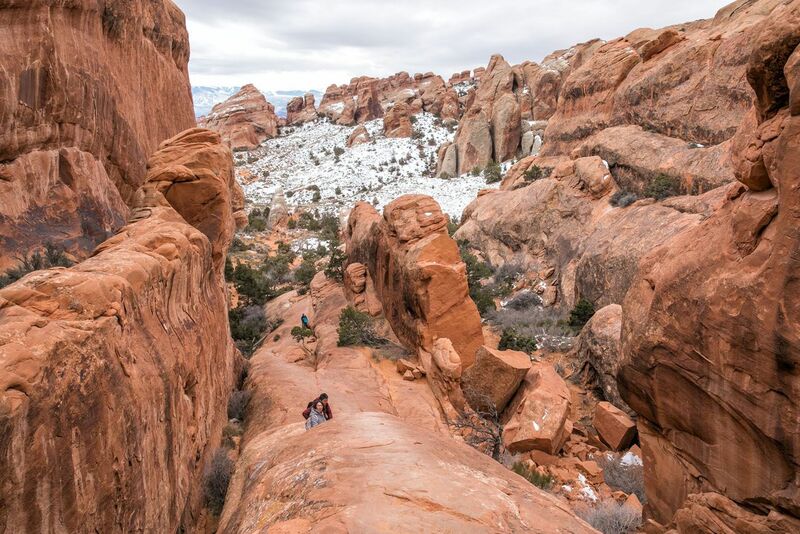 As you approach Double O Arch, the trail gets more difficult (and more fun) now that you have short sections of rock scrambling. The views from the sandstone fins are unbeatable. And hiking back on the Primitive Trail is a great way to add a little adventure to your day. We know that splitting up works well because that is exactly what we did. Kara was recovering from an injury so she was very limited in how much hiking she could do. While Tyler and I hiked the entire loop, Tim and Kara hiked to Landscape Arch and took the spur trail to Pine Tree and Tunnel Arches. 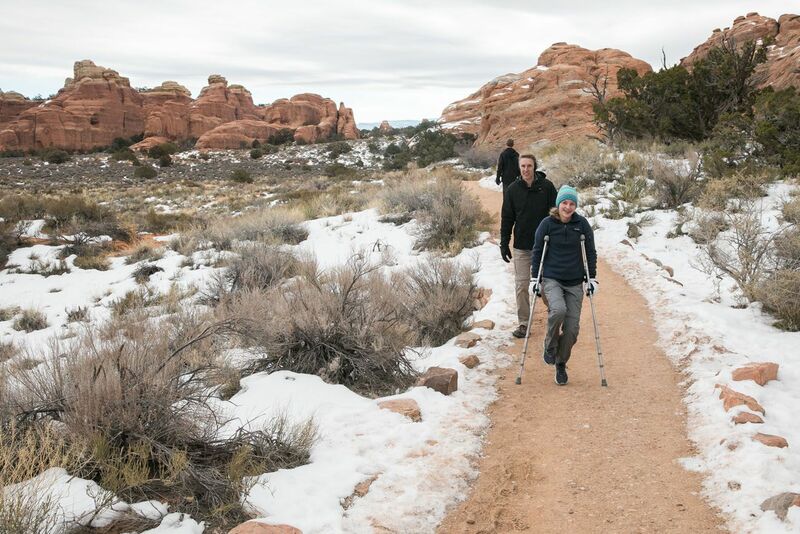 Kara “hiked” a portion of the Devils Garden Trail on crutches. Map of the trail. The main trail is red. The Primitive Trail is blue. The yellow trails are spur trails and the purple trail goes to Dark Angel. Park in the enormous parking lot at the end of Devils Garden Road. The trailhead is well marked and there are restrooms here if you need them. 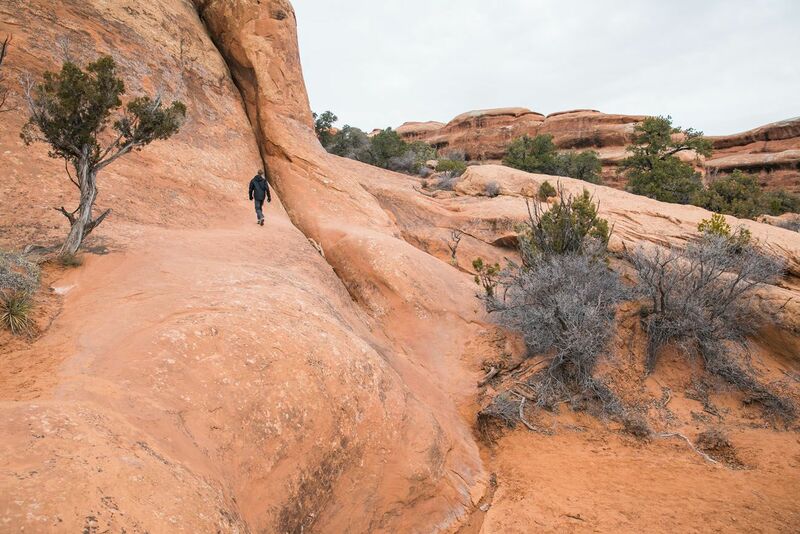 The main trail is well graded and relatively flat until you get to Landscape Arch. Along the way, you will walk through sandstone fins, just like these at the very start of the hike. About 10 minutes into the hike you have the option to take the spur trail to the right. This takes you to two arches. This short trail is 0.5 miles round trip and adds 15 to 20 minutes to your hike. The first arch is Tunnel Arch. You can only view it from a distance but it’s worth a quick look. Pine Tree Arch is better, in my opinion. You get to see it up close and if there aren’t too many people here, you can take photos in the arch. 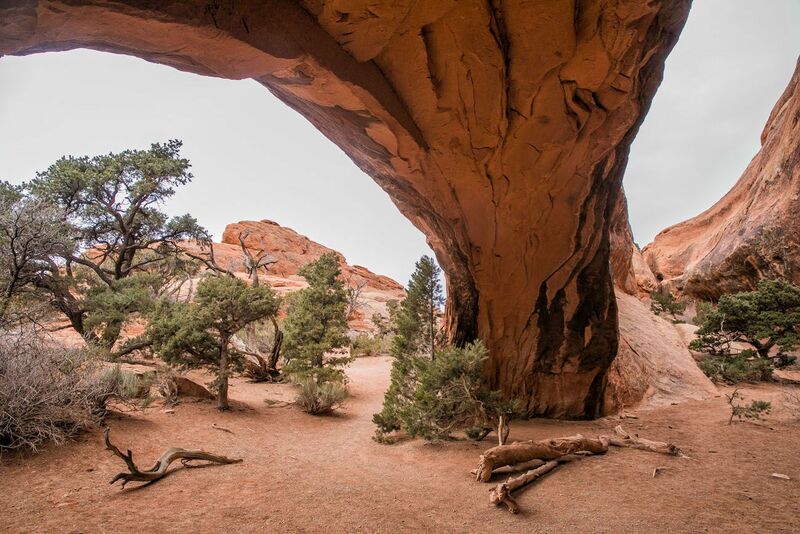 Take the spur trail back to the main trail and continue the walk to Landscape Arch. Here is the view along the way. 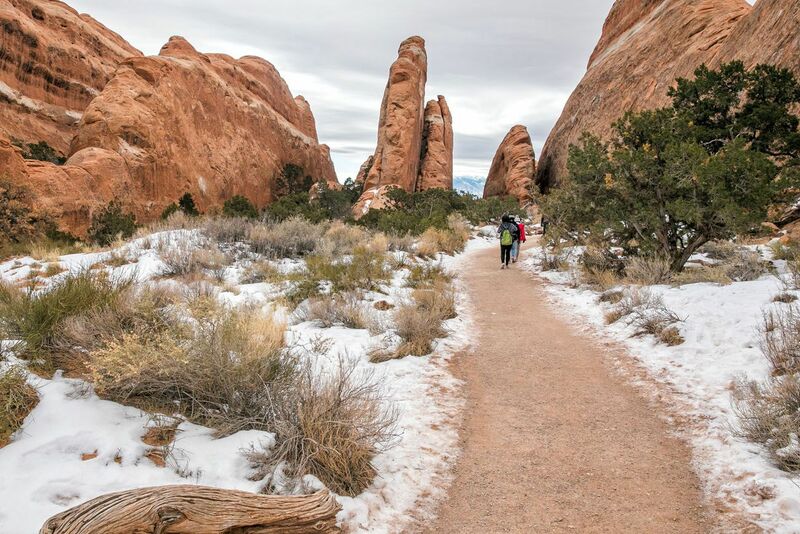 Follow the main trail until you get to Landscape Arch. 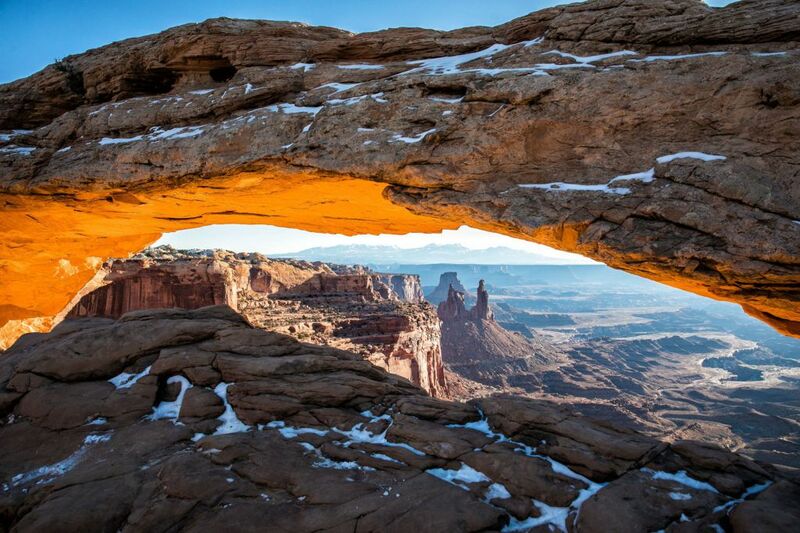 This arch has one of the world’s longest spans. It stretches 306 feet but it is only 11 feet wide in its narrowest section. In 1991, a portion of the arch fell and this is all that remains. At some point, hopefully not too soon, the rest of the arch will fall. There are several different viewpoints here so have fun photographing the arch. You can turn around here or keep hiking to Double O Arch. This is when the hike really starts to get fun. 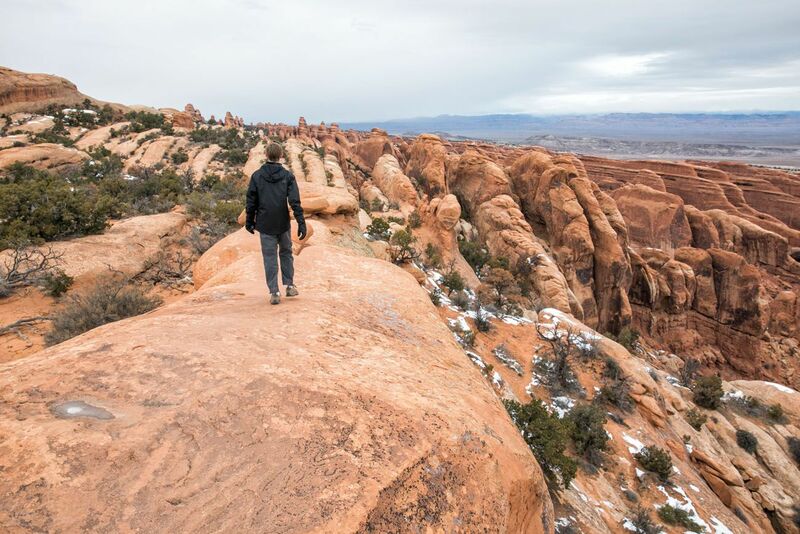 From Landscape Arch, hike up the sandstone fins. Enjoy the spectacular view back over the main trail. 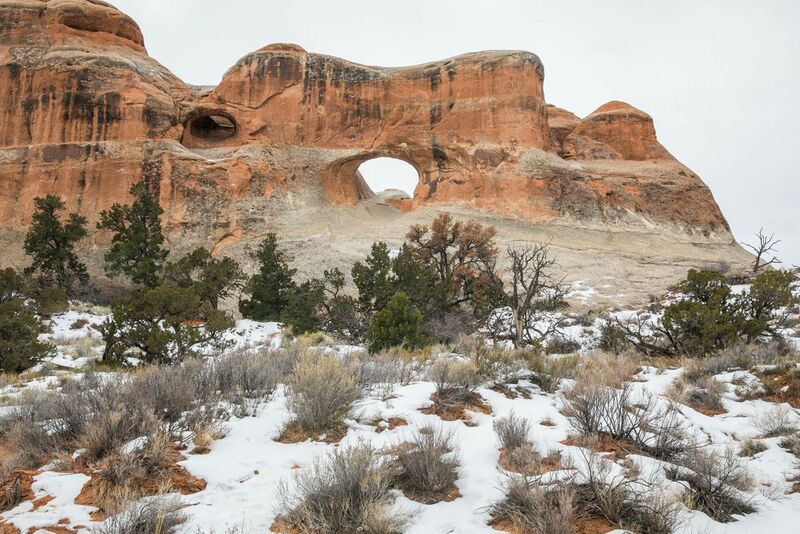 It does not take long to reach the spur trail to Navajo and Partition Arches. 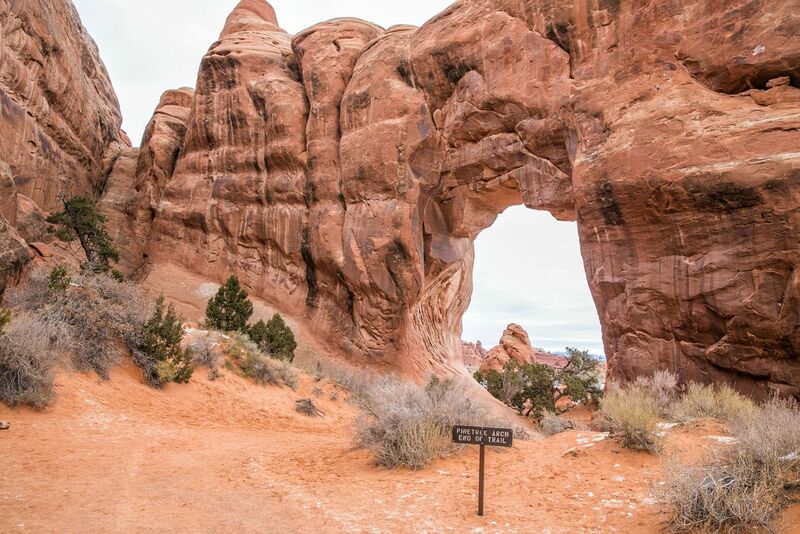 If you choose to take this trail, it adds 0.8 miles round trip and it takes about 30 minutes to visit both arches. 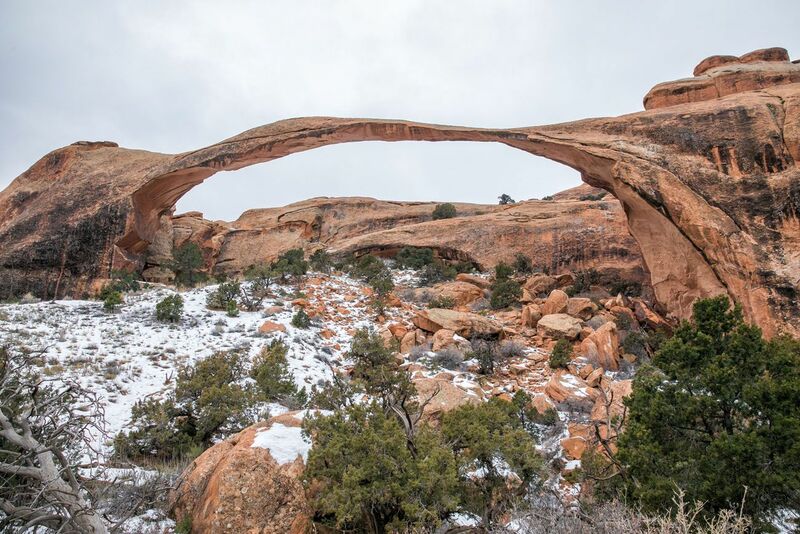 The spur trail splits and you can visit these arches in either order. Somehow we got very lucky. Tyler and I were the only ones here. This wide, low arch looks and feels more like a cave than an arch. People love to pose for photos in the arch, so be patient if you want a photo without anyone in it. As you can see, I didn’t have much patience (not with Tim and Kara waiting for us at the car). 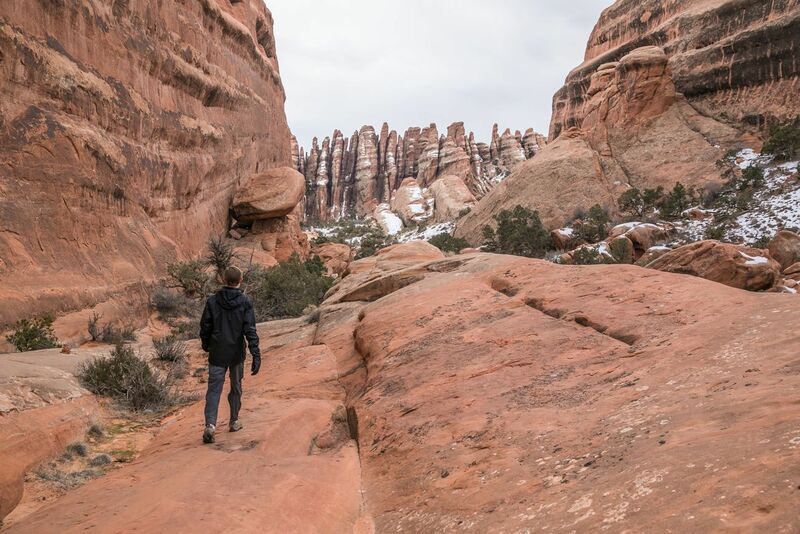 As you hike towards Double O Arch, the scenery keeps getting better and the trail gets less crowded. Follow the signs for Double O Arch. The trail is well marked until you get to one large, sandstone fin. Shown in the photo below, you climb up onto the fin and then turn right to walk on top of it. The views from here are incredible on one of my favorites in Arches National Park. Before you get to Double O Arch, you will see a sign for Black Arch Overlook. This 2-minute detour is well worth it. Not only can you see the Black Arch, way off in the distance, but the landscape is amazing here. 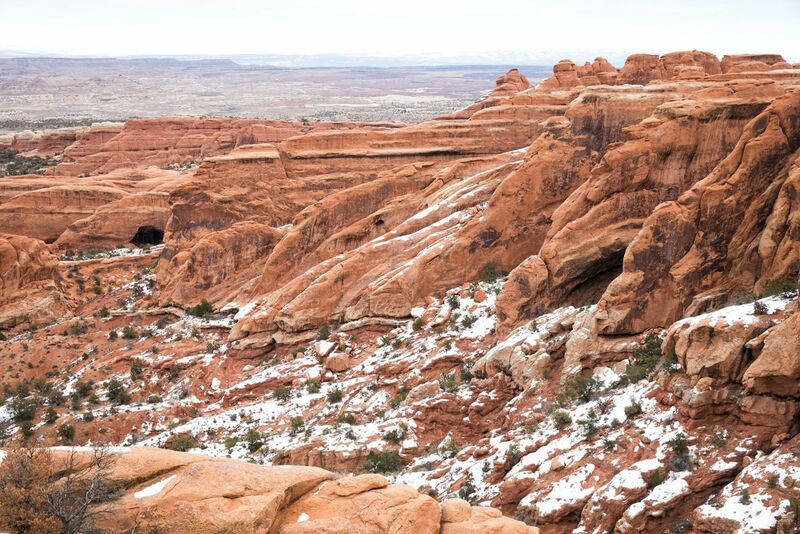 A little bit of rock scrambling over the sandstone fins and finally you are at Double O Arch. This looks like a smaller version of Double Arch at the front of the park. From here, you can walk back to your car or continue the adventure. Dark Angel is a giant pillar of sandstone rock. 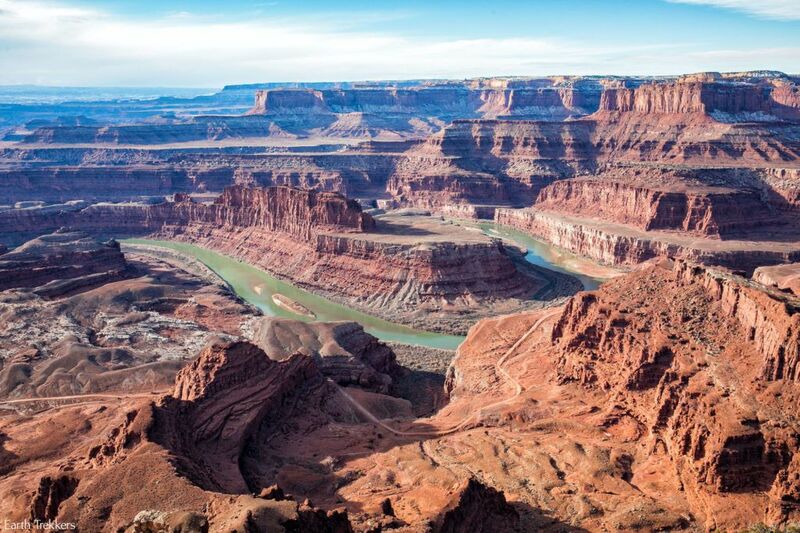 To get here, take the trail from Double O Arch. This detour adds 0.8 miles to the hike. 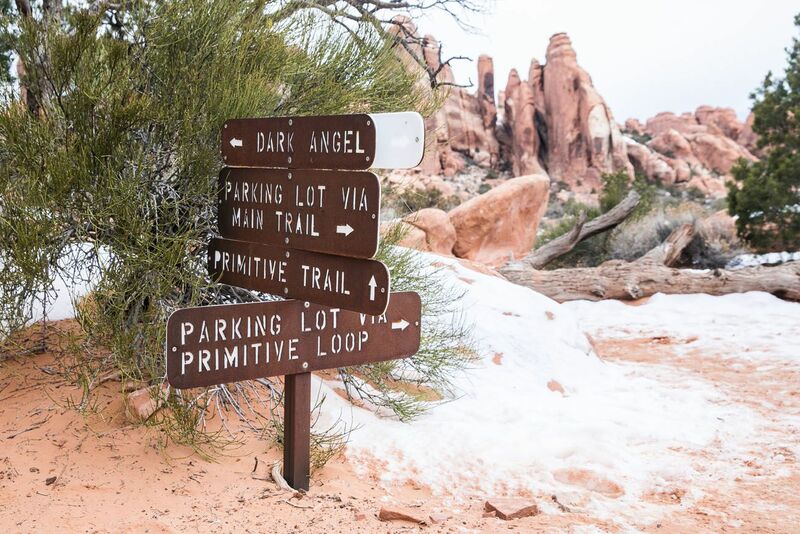 Once you visit Dark Angel, you can return to your car on the main trail or take the Primitive Trail. 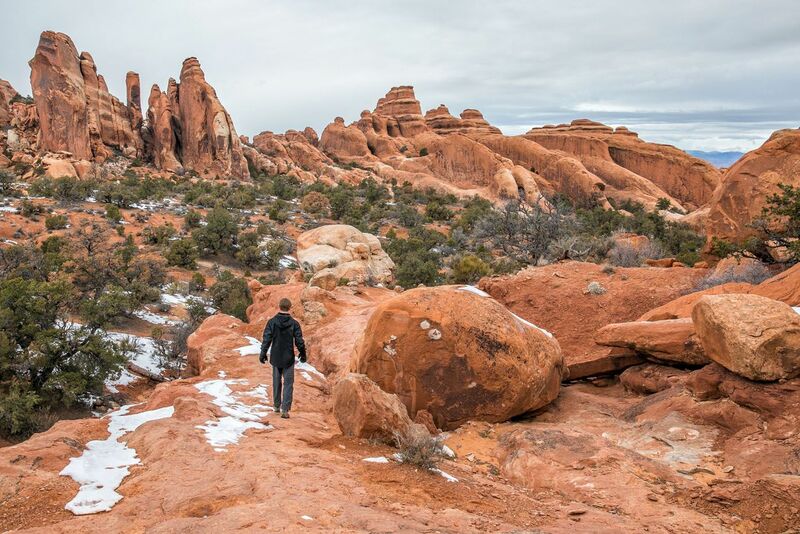 The Primitive Trail is a poorly marked trail but it takes you through some of the best scenery in Arches National Park. Expect sections of rock scrambling and a few short, strenuous climbs. For part of the hike, you are walking in a wash (a dry riverbed), so there may be small pools of water that you have to jump over. In December, the wash was completely dry. You will need to do a bit of route finding to stay on the trail. For most of the way, the trail is marked with cairns, stacked stones that serve as trail markers. However, these cairns are few and far between in some spots, so they can be difficult to spot. It is very easy to lose the trail. We lost it and saw several other groups of people wandering around, lost as well. There are numerous “false trails.” These are trails that were formed by other hikers who stumbled off the main trail, creating short, dead-end trails. They can be very misleading. My advice is to hike to one cairn and then look for the next one. 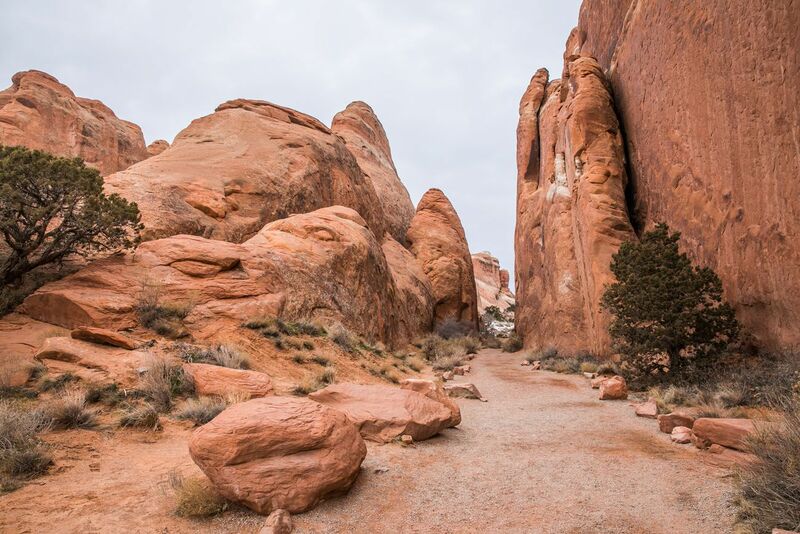 Pro Travel Tip: The Devils Garden Trail is on Google Maps. 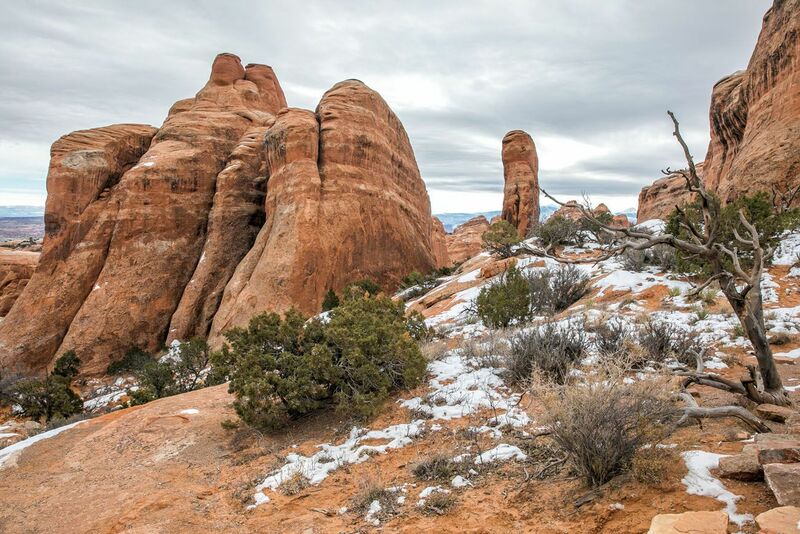 Cache the map on your phone before you visit Arches National Park. You won’t have cellular service on this hike but you will have GPS. Using Google Maps you will be able to see your location. If the map shows that you are on the dotted line (the trail), you are doing great. However, if you are not on the dotted line, most likely you stumbled off of the trail. 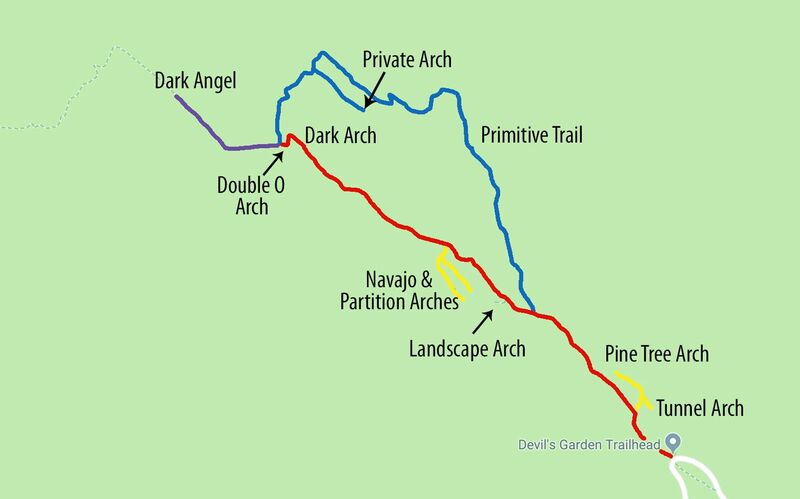 While on the Primitive Trail, you can add on the short detour to Private Arch. It’s a small, low arch and not very thrilling, but you may it all to yourself. After climbing up and over numerous fins of rock, it is a long, somewhat boring hike on a sandy trail until you get back to the main trail. The Primitive Trail meets up with the main trail near Landscape Arch. From here, it is about a 30-minute walk to the parking lot. Cache your maps before you go. You will not have cellular service on the Devils Garden Trail. You can still use the GPS on your phone to get your location on the hike. Bring sunscreen. There is very little shade on the trail. Bring plenty of water. In the warmer months, plan on bringing at least 2 to 3 liters of water per person, especially if you plan to hike the entire loop. Hiking with Kids. This is a great trail for kids. 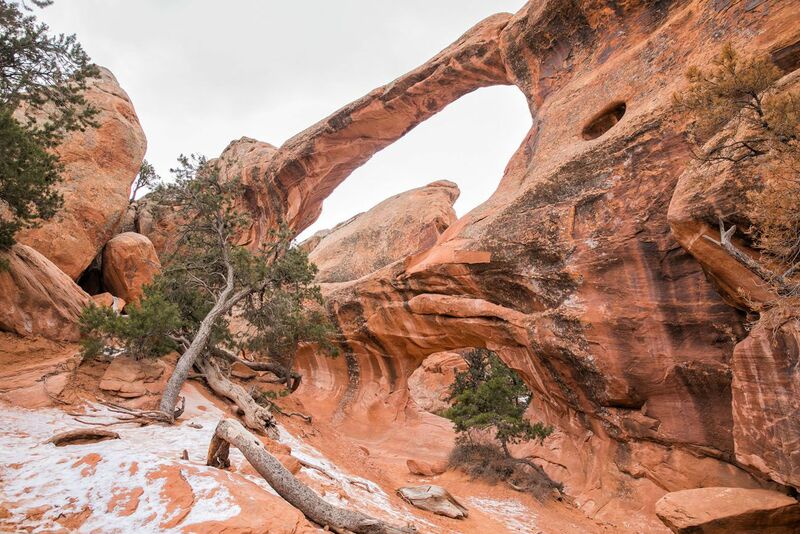 Younger kids should be able to handle the trail to Landscape Arch. 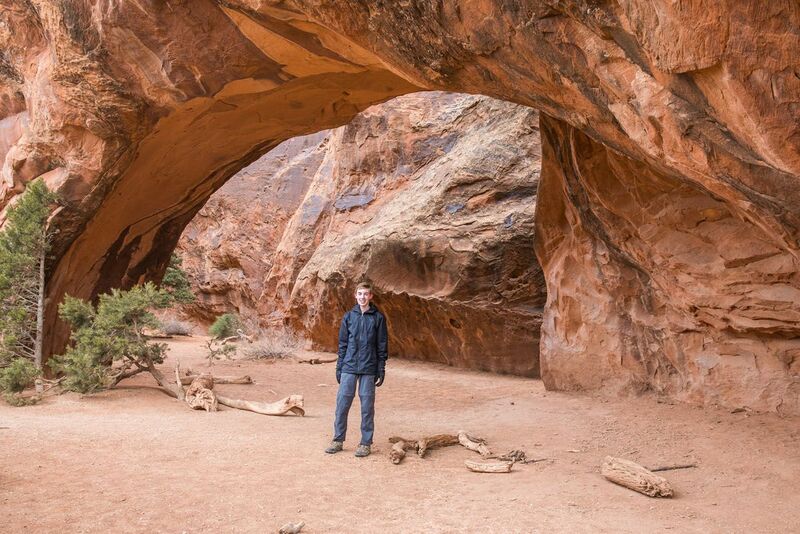 Older, more adventurous kids will love the hike between Landscape Arch and Double O Arch. There are drop-offs while walking on the fins, so keep an eye on young kids here. If you feel confident in your route finding skills, consider taking older kids on the Primitive Trail. 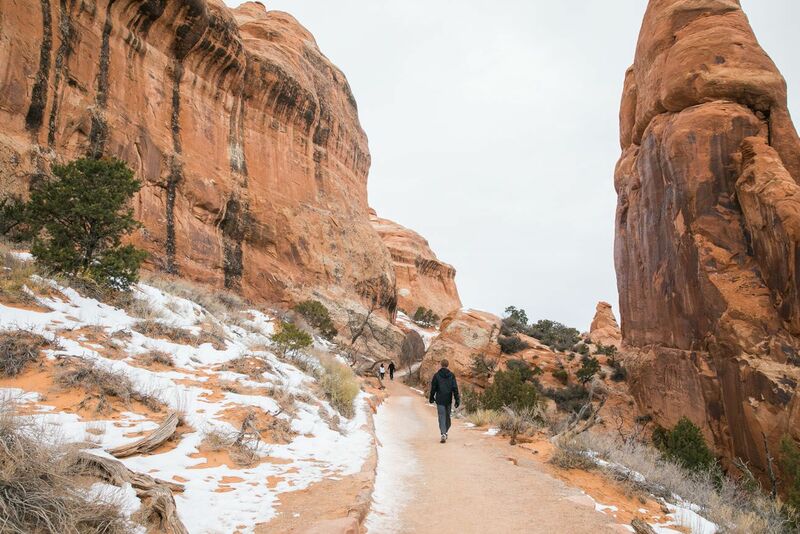 We visited Arches National Park on December 27, 2018. Parking lots were usually full but the park didn’t feel too crowded. The clouds in the sky were from a storm that was dropping snow in nearby Canyonlands National Park. Too bad it didn’t snow during our visit to Arches. That would have been a treat! 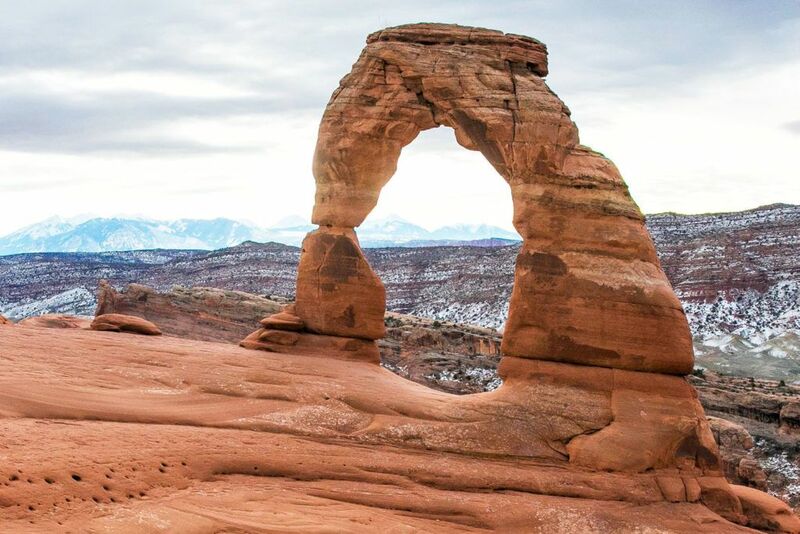 Are you planning a trip to Arches National Park? If you have any questions about this hike or the park, comment below! What did you use for maps on your hikes. I see you noted “Cache your maps before you go.” What maps do you mean? Do you recommend a specific ap?